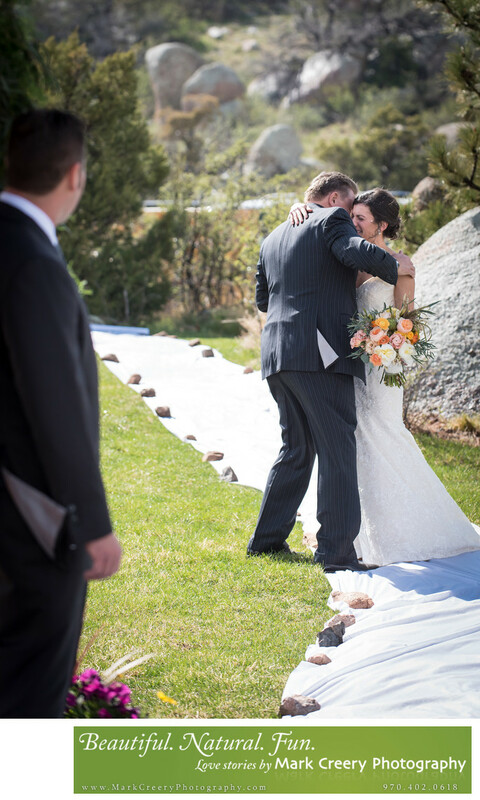 This emotional wedding photo taken at Eagles Nest Ranch in Livermore, shows the importance of having a photographer who is ready to capture fleeting candid moments. The bride, Amber, was walking down the aisle of white fabric, when halfway along the enormity of the situation hit her and she got emotional. Her dad looked over at her and then gave her a big hug to acknowledge what a big deal it was for him too. It's this kind of powerful connection that I strive to capture. The expression on Amber's face was was brief, as she didn't want to break down before the ceremony had started. My instincts to not let down my guard allow me be ready when something like this happens. I wanted to frame the groom on the left of the photo to show him waiting for his bride as this unfolded. The venue itself is great location for wedding photos. The ceremony site is overlooking Roosevelt National Forest, with rolling hills as far as the eye can see. The wooden gazebo give some shelter from the elements and allows for floral displays like arches and garlands. Location: Eagles Nest Ranch, Livermore Colorado 80536.